When you think about it, process improvement is in our genes. Everything we do each day is part of process–directly or indirectly, documented or not. Getting our kids to school, getting to work, helping customers, shipping product, getting the kids to sleep. Live, Die, Repeat. It is in our DNA to continually look for ways to improve or optimize our processes to achieve the desired outcome, and to find a simpler, more effective way to maximize time and quality. It’s similar to taking a different route to work to save time, or studying with your children to maximize learning and quality of a homework assignment. However, a simple change can bring enormous impact to any environment. 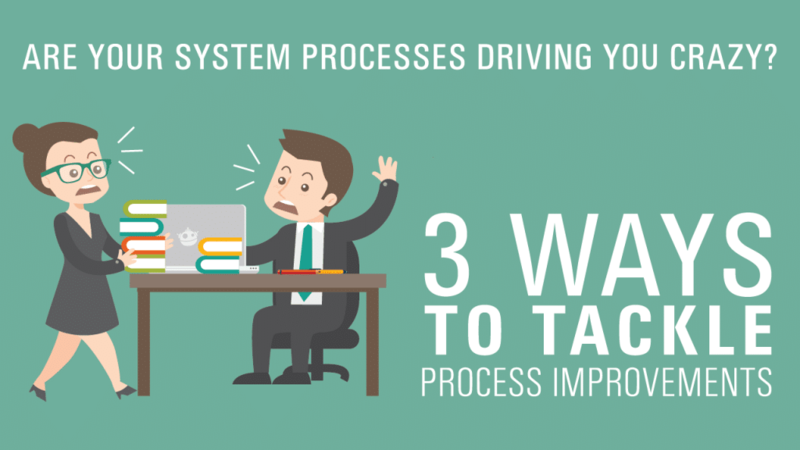 To ensure successful process improvement, there are three areas that must be considered. I’m talking about customers, people, and the process. Your customer’s experience is the basis for continual growth, so keep a seamless and exceptional service experience in mind. Remember, it is your customer’s needs that are the focus. Improving this process means taking the time to discuss the challenges a client faces in the workplace and talking about the type of system that can best solve the problem within the company’s various perimeters. What do you call a new system that nobody uses? A really expensive party for one. User adoption can stop a process in its tracks if a team is not onboard. Improved user adoption starts with buy-in from the beginning. When a co-worker is unsure how a new system could improve his or her workload or process, tell him about the capabilities. Tell him how this system has improved your workload. Better yet, ask him or her what parts of the job causes delay and point out specific fields that could remedy those challenges. Documenting the process is vital to truly optimizing it. Sometimes you don’t realize all the red tape that can accumulate until you take a step back and review it. Organizations that are successful with Salesforce take into account these areas and run like a well-oiled machine. Also, they continually review these areas to ensure continuous improvement to processes as they grow. When optimizing a process in Salesforce, understanding the basics of these strategies, including the process, is a great place to start. Keep in mind, sometimes the simplest questions can deliver the best answers. What is most important to your customers? What is the current process? What are the inputs, and where do we add value? What are the outputs? Does this meet our desired outcome? A good Salesforce consultant will have extensive experience in this work and can make quick recommendations that make a big difference in your environment, leaving process out of the way of sales representatives to keep them focused on what they do best–selling and attending to your customer. Whether going with a Salesforce consultant or handling the system updates on your own, a thoughtful continuous improvement process plan should always be a staple process in any organization’s operating model. It doesn’t have to be complex, but it has to be present to achieve user adoption, efficiency, and an exceptional customer experience–not to mention how much it helps get the kids to school and bed on time. Awesome insight, Kelli, and so very true! Tackling those three basics of customers, people and the process itself helps to solidify a strong foundation to build process improvement upon. Thanks for sharing!